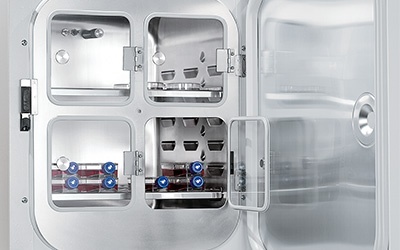 All kinds of culture vessels can be used to cultivate adherent and suspension cell cultures or hanging drop cell cultures. 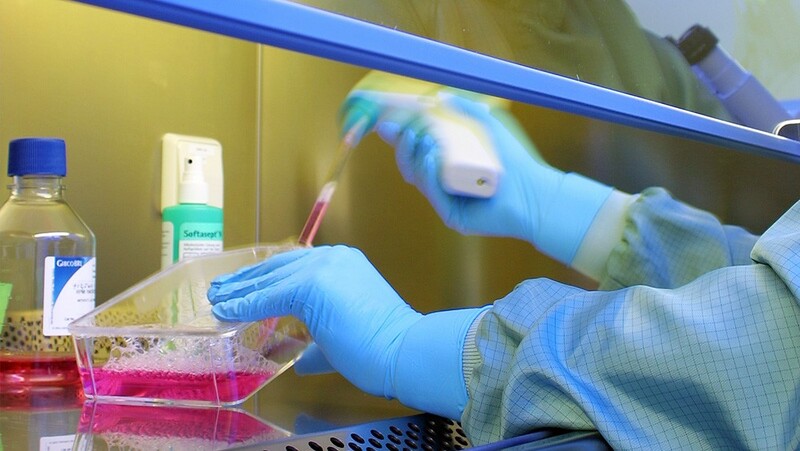 To name but a few, these include petri dishes, T-flasks, microtiter plates – e.g., microplates conforming to SLAS standards (Society For Laboratory Automation and Screening; formerly the SBS standard) for screening operations (HTS in active ingredient research) – foils for 3D cell cultures, and roller bottles. As far as the pH value is concerned, there is a sensitive balance between the concentration of dissolved CO2 and HCO3 (bicarbonate) contained within the medium and the concentration of CO2 in the atmosphere. For this reason, a buffering agent is added to media, e.g., in the form of organic HEPES or a CO2-bicarbonate based buffer. Fluctuations in the concentration of CO2 in the atmosphere result in undesirable changes to the pH value within the cell culture. For this reason, a carbon dioxide concentration of between 5 and 7 vol. 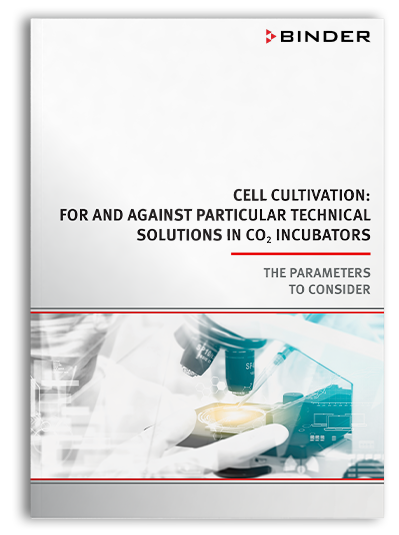 % is maintained inside CO2incubators as appropriate for the specific cell culture concerned. Example: If a pH of 7.2 is measured in a medium buffered with 2.20 g NaHCO3 per liter, the concentration of CO2 in the medium environment is 8 vol. %. The CO2concentration inside incubators is measured using either an IR sensor (infrared sensor) or a TCD (thermal conductivity detector). 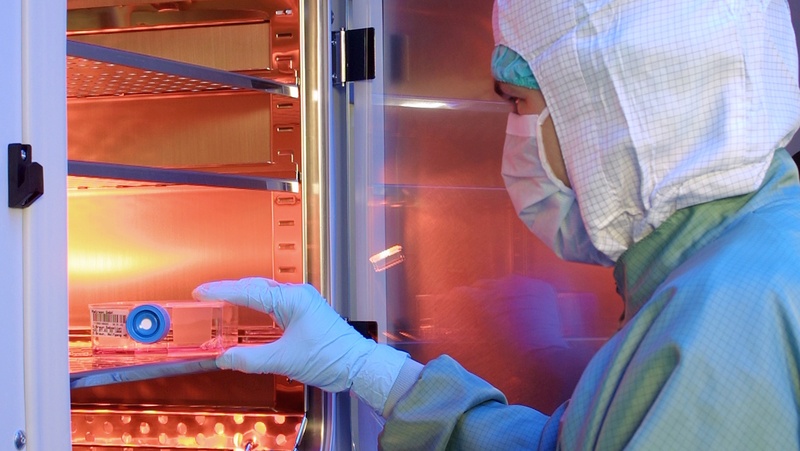 CO2 incubators can be sterilized using a variety of methods. One example of a reliable, reproducible, and efficient method is hot-air sterilization at 180°C. The water pan should be cleaned regularly and the incubator in accordance with the SOP. Split inner doors help to prevent the ingress of contamination. In the context of CO2 incubators, the “less is more” principle encompasses a multitude of design features that ensure good growth and counteract the risk of contamination. Examples include: having rounded corners inside an incubation chamber and no welding seams, doing away with unnecessary fixtures (such as those for guiding the air inside the incubator), and doing away with fans and HEPA filters in the interior. To find out what else is important, see our Buyer’s Guide for CO2 incubators.